Scientists at the Department of Energy's Oak Ridge National Laboratory are working to understand both the complex nature of uranium and the various oxide forms it can take during processing steps that might occur throughout the nuclear fuel cycle. An improved understanding of uranium oxides, which fuel the vast majority of the U.S nuclear power fleet, could lead to the development of improved fuels or waste storage materials. ORNL researchers approached this problem computationally with help from the lab's Compute and Data Environment for Science (CADES). Through CADES, ORNL staff members have access to computing resources that engineers tailor to specific projects, enabling management and analysis of massive datasets too cumbersome to tackle otherwise. Amorphous uranium oxides are common, but the lack of a consistent structural order within them can be difficult to model. 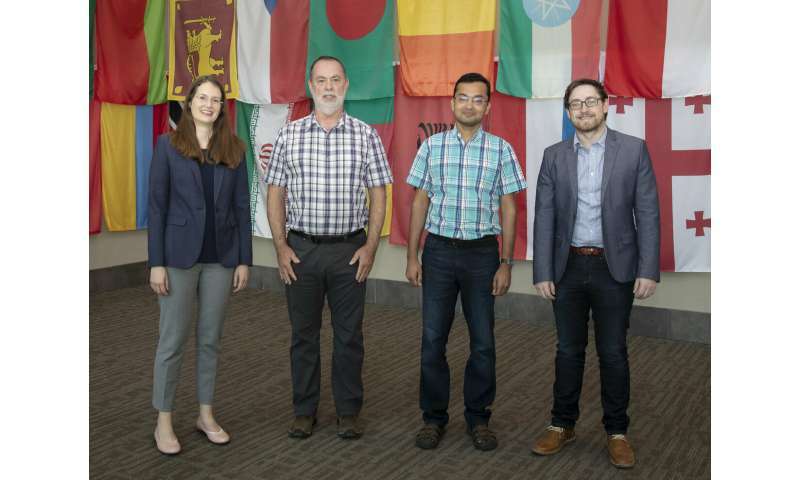 To address this challenge and accelerate the process of identifying novel uranium oxide phases, scientists in ORNL's Nuclear Security Advanced Technologies Group evaluated the energy of 4,600 different potential crystal structures of uranium oxide compositions. Using genetic algorithms—computational tools designed to efficiently solve problems according to the theory of natural selection—the team studied these structures on a CADES high-performance computing cluster called Metis, a two-cabinet Cray XK7 system. This method helped them build statistical relationships between structural stability and the local uranium environment, two factors that affect the crystallinity of solid forms. Interpreting this information could lead to a more concrete understanding of how crystalline and amorphous uranium materials form in the nuclear fuel cycle. "Our main goal is to try to understand some of these amorphous phases for uranium oxides," said Ashley Shields, an ORNL postdoctoral associate. "They arise during the nuclear fuel cycle and are difficult to study, but we hope that our computational approach will help us better characterize samples of these materials." After determining that the project required a significant amount of computing power, CADES personnel provided Shields and her team with exclusive access to the entire Metis system for 15 days to evaluate these structures using the Universal Structure Predictor Evolutionary Xrystallography (USPEX) software package and the Vienna ab initio Simulation Package (VASP). "Given the sheer number of calculations we had to execute to build this database of structures, we really needed the help of the CADES team," Shields said. "Without their support, as well as recent advances in computing power and research from other groups to develop genetic algorithms specifically applied to structure prediction problems, this project wouldn't have been possible." Shields and her team identified a potentially stable crystalline phase for a material, U2O7, which has only been observed experimentally as an amorphous phase. To learn more about this phase, they studied 2,700 possible crystal geometries for U2O7 in addition to the 4,600 original structures. Their findings are published in Optical Materials. Because an amorphous U2O7 material can be made from amorphous UO3, NSAT's Andrew Miskowiec and Jennifer Niedziela led experiments aiming to crystallize U2O7 from samples of UO3. To support this effort, Shields compared the simulated effects of pressure on known phases of UO3 and the predicted U2O7 structure, identifying pressures where experimentally observable structural changes may take place. "We haven't found crystalline U2O7 in the lab yet, but what we did find was really unusual pressure behavior in amorphous UO3, which led us to some really interesting physics that we're still working to fully understand," Shields said. Despite lacking definitive proof of crystalline U2O7's existence, the team noted features in the predicted structure that correspond well with features in amorphous U2O7. They identified potential coordination geometries, or atomic patterns, in line with the material. Most striking among these observations was the discovery of peroxide units in the predicted structure. "It's already proven useful to have this database of structures because clearly just looking at known crystalline phases for one material like UO3 does not provide enough information to explain all the behaviors of an amorphous sample of the same material," Shields said. Linux Systems Engineer Ketan Maheshwari and Computer Systems Analyst Michael Galloway of CADES helped set up the computational components involved in the project, from modifying source code to make USPEX run more efficiently on Metis to creating post-processing scripts—tiny operations that extract information from computational results—to decipher scientific output. "To help the team run at such a large scale and successfully use GPUs, we installed and tested VASP at scale on Metis and troubleshot the jobs as needed to ensure the work was done in a timely and efficient manner," Maheshwari said. Shields anticipates that this ongoing project will continue for at least another year and looks forward to other studies that apply machine learning and artificial intelligence concepts to uranium chemistry research. Currently, she is compiling a similar database composed of uranium fluorides, another key subset of materials involved in the nuclear fuel cycle.